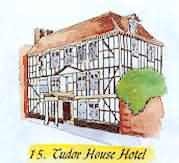 Advertise your Tewkesbury business here or on one of our other websites. Tewkesbury presents one of the best medieval townscapes in England with its fine half-timbered buildings, overhanging upperstoreys and elaborate carved doorways. 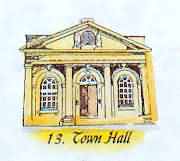 Most of the town lies within the Tewkesbury Conservation Area, over 350 of the buildings are listed of being of special architectural or historic interest. Coaching traffic brought prosperity to Tewkesbury up until the mid 19th century when the advent of the railways bypassed the town and the Industrial Revolution had little impact. It is a paradox that we now have these, what was then, unfortunate occurrences, to thank for such perfect preservation of its fine buildings. Start your tour of the town here. The town museum is a 17th century rebuild of an earlier structure. 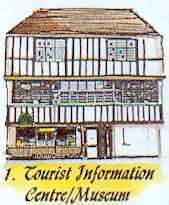 The building was converted to a museum and Tourist Information Centre in1962 and houses a interesting collection showing the history of Tewkesbury. 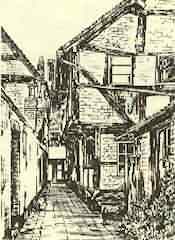 The Abbey Row Cottages was built in the late 15th century for the Benedictine Monastery as a commercial venture and consisted of shops which were opened to the street by lowering their shutters to act as counters. One building now houses the National Trust Shop (2). 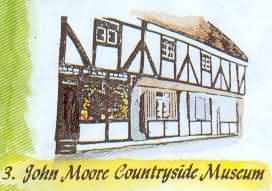 The John Moore Countryside Museum and the Little Museum also form part of this row (3). 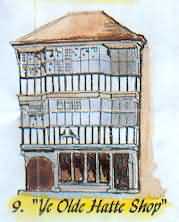 The little museum is a restored merchant's house retaining many medieval features. The building of the Abbey was started in 1090 and was consecrated in 1121. The inside of the building has massive Norman pillars and the central tower is said to be the finest Norman tower in the World. 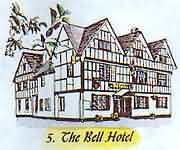 The Bell Hotel was built around 1696 and probably stands on the monastic hostelry within the Abbey precincts. In the novel 'John Halifax, Gentleman' by Mrs Craik, The Bell features as the house of a wealthy tanner - Abel Fletcher. 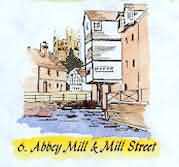 The foundations of the Mill are thought to date back to the late 12th century when the River Avon was diverted into the town to power the mill of the Benedictine Monastery. 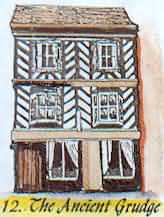 The present building is late 18th century and was in use until 1933. 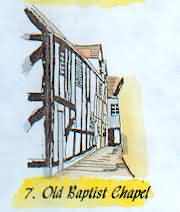 The Old Baptist Chapel was originally a 15th century three-bay hall and restored some 30 years ago. It was adapted to a place of worship in the early 17th century. It is believed to be one of the first Baptist Chapels in England. 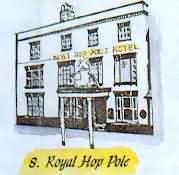 The Royal Hop Pole was one of Tewkesbury's coaching inns and dates back to the 18th century.Queen Mary stayed at the hotel in 1930 and the Royal Arms are shown on the top of the portico. The fine doorcase on the left has the date 1694 on the door head when the building was refurbished, and a 'Beadle's Hat' is suspended from the studding of the first floor. 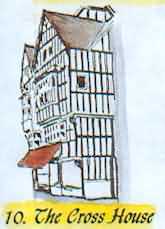 One of the finest timber framed houses in the town of Tewkesbury and dates back to the late 15th century. It has a magnificent entrance hall, Elizabethan panelled rooms and a fine staircase. 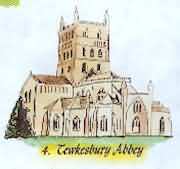 It is believed to have been at one time the Court House of the Lords of Tewkesbury. 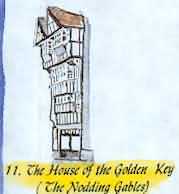 The House of the Golden Key also known as The House of Nodding Gables is an early 16th century timber framed building, heightened by one storey in the 17th century. The famous 'Nodding Gables' are the result of a break in the ridge piece of the new structure which caused it to slip forward. The Ancient Grudge was built in 1471 and was re-fronted in the late 16th century. The name refers to the enmity between the Houses of York and Lancaster which was the cause of the battle of Tewkesbry in 1471. 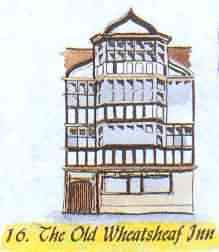 The Wheatsheaf in was built around 1500 and was in use as a Public House until 1956. 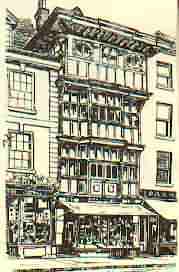 There are other wonderful ancient buildings and Tewkesbury's famous alley ways to explore including Clarence House and Lilley's Alley (above), Craik House and Turners Court, The Olde Black Bear inn (where William Shakespeare is said to have performed with a traveling troupe), Berkley Arms, Ancill's Court and Barsanti's Confectioners.